The effects of future output price uncertainty and wage uncertainty on a firm’s investment decision are examined in this paper, by assuming the competitively risk-neutral firm maximizes the expected value of the sum of discounted cash flows. We find that the optimal investment behavior is such that the expected proportional growth rate of investment is invariant over time, although there exists a tradeoff between the effects of the two uncertainty on firm’s investment because the shift in output price has positive effects on firm’s investment, whereas the shift in wage has negative impacts on firm’s investment. And what’s more important, fluctuations in output price and wage are correlated so that changes in output price tend to be accompanied by changes in wage. During the past decades, many scholars studied the effects of uncertainty on a firm’s input and output decisions. Regarding to this topic, one can see references we enumerate at the end of the paper and etc. Within those papers, considerable results and conclusions have been achieved. For example, Hartman  examined the impacts that increased uncertainty in future output prices, wage rates and investment costs has on the quantity of investment undertaken by a firm, and pointed out current investment doesn’t decrease with increased uncertainty in future output prices as well as wage rates, and invariant to increased uncertainty in future investment costs. The sign of the investment-uncertainty relationship is negative, and that the quantitative negative impact is substantially greater in industries dominated by small firms are shown in Ghosal and Lougani  by studying the impact of profit uncertainty on investment and whether or not this response is different in industries that are dominated by small firms versus those that are dominated by relatively larger firms. These results are robust to accounting for potential endogeneity of the uncertainty measure, alternate procedures for measuring uncertainty, and alternate ways of segmenting industries into smalland-large firm groups. In Peeters , empirical results proved that both demand and price uncertainty correlate significantly with corporate investment, and that output price uncertainty depresses investment in Belgium and Spain. Applying dynamic panel data methods, Temple, et al. found that all sources of uncertainty exert a considerable negative impact on investment while financial factors may be important in some industries. Bloom offered a structural framework to analyze the impact of these uncertainty shocks and built a model with a timevarying second moment, which is numerically solved and estimated using firm-level data in Bloom . The parameterized model demonstrated higher uncertainty causes firms to temporarily pause their investment and hiring, and the increased volatility from the shock induces an overshoot in output, employment, and productivity. Thus, uncertainty shocks generate short sharp recessions and recoveries. In Lee and Shin , they discovered that in the absence of fixed adjustment cost, a higher labor share strengthens the positive relationship between investment and uncertainty, whereas in the presence of a lumpy adjustment cost, optimal investment will drop to zero as uncertainty increases if labor share is low, but will increase if labor share is high. Both the case in which the firm faces an uncertain price in a perfectly competitive commodity market and the case in which the firm faces an uncertain downward sloping demand function are studied in Nielsen , the results showed higher expected price increases optimal output, and a quantity setting policy implied a tendency towards smaller quantities and higher price, while on the contrary, a price setting policy implied a tendency towards lager quantities and lower price, than under certainty. Besides, Lucas and Prescott  made an extension of “cost-of-adjustment” type investment theory to situations involving demand uncertainty, and determined the time series behavior of investment, output, and price in a competitive industry with a stochastic demand. The effects of demand and cost uncertainty on a firm’s investment, output and pricing decisions are examined in Pindyck , the conclusion suggested the desired capital stock and output level will be higher/lower if marginal adjustment costs are rising at an increasing/decreasing rate, under the condition that demand shifts stochastically. At the same time, when the marginal adjustment costs of a risk-averse firm rise at an increasing or constant rate, uncertainty will increase the desired capital stock and output. Furthermore, the effects of stochastic fluctuations in factor costs are the same as demand fluctuations on a firm’s behavior. And what’s more important, these results are robust and consistent whether a firm is competitive or monopolistic. In particular, Abel  demonstrated the results of Hartman  continue to hold using the stochastic specification of Pindyck  and the analysis of Pindyck’s applies to a so called “target” investment rate which is not optimal in general, by developing a special case of the model in Pindyck’s to verify the effects of output price uncertainty on investment decision for a risk-neutral competitive firm with convex adjustment costs. Abel and Eberly  extended the theory of investment under uncertainty to incorporate fixed costs of investment, a wedge between purchase price and sale price of capital, and potential irreversibility of investment. They found investment is a nondecreasing function of shadow price of installed capital, and the optimal rate of investment relies on the value of shadow price relative two critical values. By using information on the subjective probability distribution of future demand for firm’s products, Guiso and Parigi  investigated the effects of uncertainty on the investment decisions of some Italian firms. The results suggest uncertainty weakens the response of investment to demand, and the negative effects of uncertainty on investment can’t be explained by uncertainty proxying for liquidity constraints. In Bloom, et al. , they showed that with (partial) irreversibility higher uncertainty reduces the responsiveness of investment to demand shocks, and uncertainty increases real option values making firms more cautious when investing or disinvesting, which confirmed both numerically for a model with adjustment costs and time-varying uncertainty. And so on (See [14- 27]). Ultimately, it’s worth mentioning that the shortcoming of Pindyck  is that it didn’t derive an expression for the optimal rate of investment in the general model, but analyzed it by stochastic phase diagram approach instead, of which the problem is that it’s unreasonable for a firm to be on the locus with zero expected change in investment, even in the long-run. In view of this, we construct a concrete case can be solved explicitly herein. In addition, our model is an extension to that in Abel , since we take output price uncertainty and wage rate uncertainty into account simultaneously, rather than consider output price uncertainty only. Evidently, it’s sensible and logical to consider the price uncertainty and wage uncertainty together because fluctuations in output price tend to be accompanied by variations on wage in general, that is, changes in output price and wage are correlated. The major contributions, in brief, of this paper relative to existing literatures are, on the one hand, an explicit solution is derived and firm’s investment behavior is analyzed qualitatively and quantitatively rather than just qualitatively, on the other hand, both price and wage uncertainty are taken into account reasonably and simultaneously rather than consider the price uncertainty only. What’s more important, so far to our knowledge, the question we discussed in the paper is still open. As we expected, our conclusion is consistent with that in Abel , which shows that the optimal investment behavior is such that the expected proportional rate of change of investment is constant over time. The remaining of this paper is organized as follows. In Section 2, we describe our model at length. Section 3 analyzes the effects of uncertainty on investment. Finally, conclusion is presented in Section 4. In this section, we will introduce the model again in detail for the sake of intactness, although it’s a special case of the model in Pindyck , and is an extension to the model in Abel . For our purpose, we give hypothesis as below. where, and are respectively capital stock and labor, and denotes technology. Without loss of generality, we normalize to unit one hereafter, i.e., . It’s obviously that satisfies the conditions of quasi-concave, i.e., And the convex costs of adjustment function is adopted by the form as is the purchase price of one unit capital(equipment), is the constant elasticity, and is the gross investment. As many literatures suggested previously, confirms with and , for any . Note that the convexity of the adjustment costs function implies that it is more costly to increase capital stock quickly than slowly. here, is the depreciation rate. here, is the instantaneous correlation coefficient for the two Wiener processes and . is the expectation operator. subject to constraints in (1)-(4). Of course, discount rate is set to be constant here. 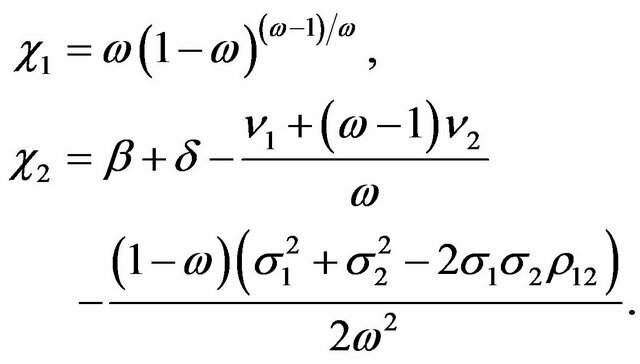 subject to (1) and , where, is a general production function with strictly quasi-concavity and is a general adjustment-cost function with convexity, and are two functions respectively with respect to . In the general case, Pindyck did not obtain an explicit solution for the optimal investment, but analyzed the firm’s investment behavior qualitatively by using stochastic phase diagram approach instead. However, our model will collapse to the the special case expressed in Abel  by setting as well as , i.e., the wage is non-stochastic. In this special case, Abel derived an explicit solution and found the optimal investment rate is such that the expected proportional rate of change of investment is a non-zero constant over time. Remark 2. We argue that it is not nonsense to assume that the wage rate follows a stochastic process in reality. Also, it’s feasible in practice. For example, Hartman  has considered the wage rate as a random variable and perfect results have been achieved. Differently, however, we here need not presume that the distribution of price and of wage rate are independent, which was proposed in Hartman’s. Conversely, the dependence of them is allowed in our paper. Fortunately, we will prove later that this case is feasible too. Alternatively, it’s logical to think wage rate changes with the fluctuation of output price. Indeed, by supposing that the firm’s goal is to pursuit the maximum profit, then, at least in the short-run, the employers would cut back their costs by reducing wage rate if the price of output falls due to some reasons. By contrary, if the price of output rises, then the firm would raise the wage rate to make employees work harder to produce more. Straightforwardly, the left-hand side of (5) can be regarded as the total mean return desired by the firm over the time interval dt, if the firm requires a mean return rate . On the contrary, the right-hand side of (5) is the whole return expected by the firm, which is the sum of cash flow and expected capital gain or loss . In other words, optimality means the desired mean return is equal to the expected return. Now, we will derive the expression of the optimal investment rate step by step. To begin, we present the following Proposition 1. It is clear to see from (6) that the optimal rate of investment does not depend on , but increases with , decreases with , since . Notice that, is the marginal revenue product of capital. where, and are all undetermined coefficients. as in (7),and as in (14). Obviously, some results can be obtained directly from (19) and (20). The firm’s value , for instance, is a linear function of the capital stock . The optimal rate of investment It does not depend on , but increases with , decreases with , since . We will analyze the qualitative effects of price and wage uncertainty on investment in this section, for given the current level of output price , and of wage rate . are respectively the fluctuations in uncertainty , which associate with , correspondingly.
. Specially, as long as then there will be no effects of changes in uncertainty on the investment behavior. Remark 3. Certainly, the conclusion above will hold as long as , but no matter the marginal adjustment cost function is convex , concave , or linear .
. Inserting (21) into this integral directly, we see that the integral is actually equal to , this indicates is the expected present value of the marginal revenue product of capital . Hence, we can say that the uncertainty affects investment by means of influencing the expected value of future marginal revenue product of capital. Finally, the dynamic behavior of investment will be explored at the end of this section. Proposition 3. The optimal investment behavior is such that the expected proportional growth rate of investment(non-zero in general) is constant over time. So far, from (23) and (25), we observe that both the expected growth rate of marginal revenue product of capital and the expected proportional growth rate of investment are constants over time, neither they depends on output price or wage. Simultaneously, it’s clearly to see the two expected growth rates are zero in the case without uncertainty. are changes in uncertainty of output price and of wage rate , respectively. The expected growth rate of marginal valuation of capital and of investment are both invariant over time. And moreover, by observing (23) and (25) carefully, we see that the expected growth rate of marginal valuation of capital multiplies the elasticity of investment with respect to marginal valuation of capital, , is equal to the expected growth rate of investment when the marginal adjustment costs function is linear, i.e., . As to the convex marginal adjustment costs function and the concave type, the relationship between the two expected growth rates are uneasy to determine, which is unlike the case demonstrated in Abel . , if set to be zero and assume the wage rate without uncertainty. At last, we mention the major contribution of this paper. For one thing, an explicit solution is derived and firm’s investment behavior is analyzed qualitatively and quantitatively rather than just qualitatively. For another thing, both price and wage uncertainty are examined simultaneously since fluctuations in output price tend to be accompanied by fluctuations in wage, rather than consider the price uncertainty only. What’s more important, so far to our knowledge, the question we discussed in the paper is still open. The author would like to express his sincere thanks to the anonymous referees for their helpful comments and suggestions, which greatly improved the presentation of this paper. The author also would like to thank the editors for their help. M. Peeters, “Does Demand and Price Uncertainty Affect Belgian and Spanish Corporate Investment?” Recherches Economiques de Louvain, Vol. 67, No. 3, 2001, pp. 235- 255. R. S. Pindyck, “Adjustment Costs, Uncertainty, and the Behavior of the Firm,” American Economic Review, Vol. 72, No. 3, 1982, pp. 415-427. A. B. Abel, “Optimal Investment under Uncertainty,” American Economic Review, Vol. 73, No. 1, 1983, pp. 228- 233. A. B. Abel and J. C. Eberly, “A Unified Model of Investment under Uncertainty,” American Economic Review, Vol. 84, No. 5, 1994, pp. 1369-1384. R. Hartman, “Factor Demand with Output Price Uncertainty,” American Economic Review, Vol. 66, No. 4, 1976, pp. 675-681. M. Kurz and M. Motolese, “Endogenous Uncertainty and Market Volatility,” Journal of Economic Theory, Vol. 17, No. 4, 2001, pp. 497-544. R. S. Pindyck, “Irreversibility, Uncertainty, and Investment,” Journal of Economic Literature, Vol. 29, No. 3, 1991, pp. 1110-1148. R. S. Pindyck, “A Note on Competitive Investment under Uncertainty,” American Economic Review, Vol. 83, No. 1, 1993, pp. 273-277. *This work is supported by Research Innovation Foundation of Shanghai University of Finance and Economics under Grant No. CXJJ-2011- 336.